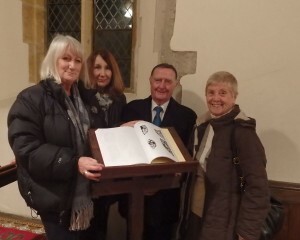 The STRADFAS Church Recorders group presented the completed Record of Church Furnishings to St Milburga`s Church Wixford B49 6DD on Sunday 6th December 2015 after the evening service. Several STRADFAS members were there for the event, which was very enjoyable. St Milburga`s is a tiny church in an idyllic setting, with many interesting features, all now documented in a bound volume: the electronic record now resides in several national record collections. Part of the Church Recorder’s group at Wixford Church, group leader Jean Vaudeau on the left. With the help of our Heritage Volunteers, and with financial support from our Young Arts Programme, the Church Recorder group has prepared a church trail for publication on behalf of Wixford Church, near Alcester. Members of the congregation were most enthusiastic and keen to support this initiative which encourages children to follow a Church Trail, answering questions as they go around. In addition, the full record of Wixford Church has been completed, and a bound copy of the record is to be presented to Wixford Church in the near future. Copies of the full record are also lodged with the County Record Office. NADFAS House, The Victoria & Albert Art library, and form part of a heritage archive.